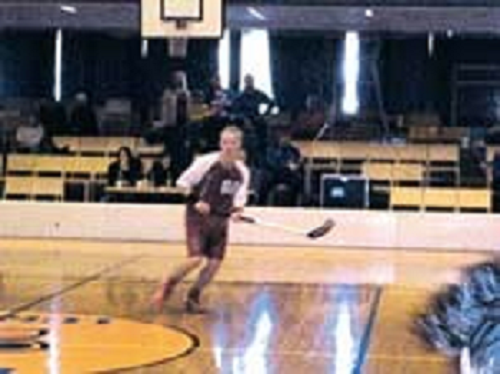 2005-2006 the b87-youth's team played their 1 season in the series facilitated by the Finnish Floorball Federation. During the season SC Saragoza played 22 games in the competitive series arranged by the Finnish Floorball Federation. Out of these, the team won 0 games, drew 0 games, and lost 22. The team gathered 0 points and scored 41 goals. Scoring leader was Jonatan Ahlvik (14+7). Top scorer was Jonatan Ahlvik (14), most assists were collected by Mikko Koskela (8) and the most penalized player was Sebastian Sj�gren (78 min). Saragozas damer inledde i l�rdags innebandys�songen i division 3 i Vasa. Samtidigt b�rjade herrarnas s�song i division fyra i Kauhajoki. F�r b�da lagen blev det b�de vinst och f�rlust i premi�ren. Kristinestadstjejerna vann �ver SB Vaasa II med 2-0 i den f�rsta matchen. Kati Kohtakangas och Malin Ingves var m�lskyttar. I andra matchen fick Saragozadamerna p� n�ten av SPV II med 2-5. Saragozas m�l gjordes av Malin Ingves och Emilia Heikinm�ki. Saragozas herrar nedlade Nurmon Jymy med siffrorna 5-2 i sin premi�rmatch. M�lg�rare var Anthony Hannus, Sebastian Sj�gren, Mats Backlund, Janne Smeds och Mikael Filppula. I andra matchen, mot FBC Luja, blev det f�rlust med siffrorna 4-8. Saragozas m�l gjordes av Janne Smeds (3) och Sebastian Sj�gren.